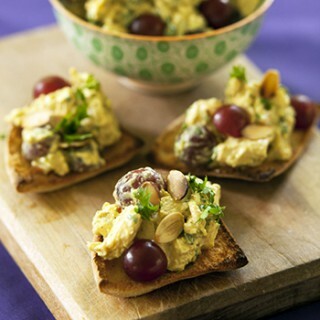 Sweet grapes, crunchy almonds and curry powder give this chicken salad recipe an extra dose of flavor. Nutrition Highlights: Keep it healthier by choosing any favorite light mayonnaise, preferably with no more than 4 grams fat per tablespoon. Toast the almonds in a small, dry skillet over medium-high heat, stirring occasionally, until fragrant, about 2-3 minutes. Set aside. In a large bowl, mix together yogurt, mayonnaise, salt, pepper and curry powder. Fold in the chicken, grapes and parsley. 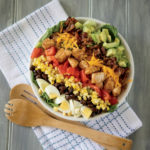 Refrigerate chicken salad mixture until ready to serve. To serve, place a cup of mixed greens in a pita, then place a scoop of chicken salad and top with toasted almonds. You can also serve the chicken salad on crackers or with lettuce boats as an appetizer. So elegant and healthy! I love the presentation! Yum! Love chicken salad. Adding the grapes and curry sounds soo delicious. I found you through the Inspire Me Wednesday link party. If you get a chance to stop by my blog, I’d love it!